This National organization provides bathroom renovations in one day. 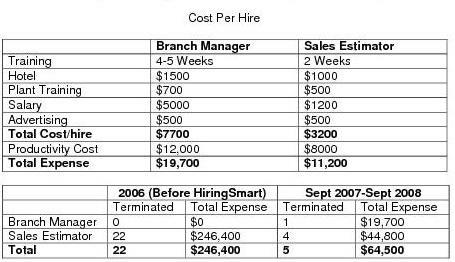 Finding competent Sales Estimators and Branch Managers for their corporately owned locations has presented both performance and turnover challenges. Between January 2006 and December 2007 they were experiencing a 16% turnover rate. With growth in the home renovation industry they saw their workforce expand from 115 people to 142 people. In September 2007 they started to implement the HiringSmart Process. Over the next 12 months, using various attraction strategies including referrals from existing employees they attracted 4,528 candidates to their online first interview portal. 2,809 (62%) of those candidates completed the online interview and submitted their responses to the recruiters. From that total 242 candidates were selected to complete the Step One Survey II assessment and face-to-face interview. The results of the HiringSmart process were felt immediately. Not only were they spending less time managing the hiring process, turnover was reduced for the year to just 3% with only 5 of the new employees leaving. The most significant savings came from fewer people going through their training program as well as fewer new employees working at a lower productive pace due to inexperience. Paving the Road to Success... with Better People. A mid-sized road construction company cements its competitive advantage through an innovative approach to hiring.